I’m currently on a cross Europe adventure, visiting 8 countries and hoping to take many great photographs. Then as I walk out onto Piazza San Marco in Venice, raise my xPan to my eye, press the shutter and….. Nothing. The mighty xPan was dead. I had a feeling something was wrong as on the last roll it started to make some horrible squeaking noises, but I convinced myself it was the new kind of film I was trying, or maybe the cold weather. Anyways, I’ve been mourning the loss ever since. I’ll send it in to Hasselblad for servicing when I get home, hopefully it is repairable. Photo of the week, from a while back… Haven’t taken many pictures since moving back, I live in a bit of a cultural wasteland… But I digress. This picture was from Berlin, one of my favourite cities of Europe. Everything fell into place for me on this one, I saw the accordion player, the light turned red so he couldn’t cross and everyone lined up and waited while (unknowingly) I took their picture. Taken with my Hasselblad xpan and Fuji Pro 400H film, handheld. This week’s photo is from Potsdammer Platz in Berlin, Germany. It’s a truly amazing place with an incredible history. It used to be a sort of no man’s land between the old East and West Germany’s, but has since experienced some renewal. There are now many buildings, restaurants, etc, and it’s a very busy place during the day as well as at night. This shot was taken with my Hasselblad Xpan using the 45mm lens and Fuji Pro 400H film. I had a bunch of shots from the same night and I really love how they all turned out so great. It’s published! 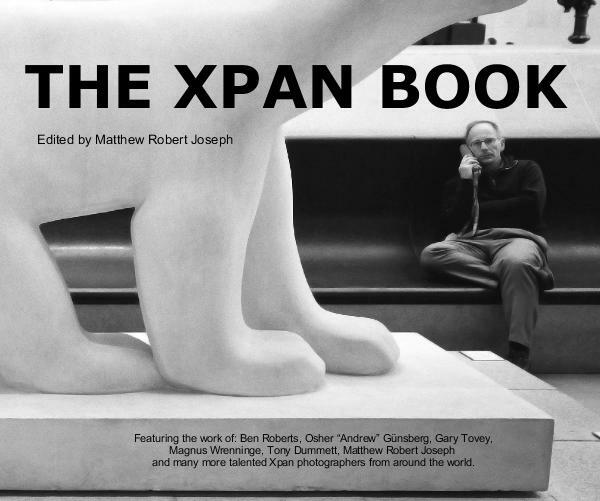 Matthew Joseph got a bunch of us Xpan owners together through flickr and put together a book of 32 Xpan pictures (colour and black and white) to be published and sold on Blurb. All the photographers donated their images, and any proceeds will go towards a charity. It was quite the undertaking for Matthew Joseph, lots of haranguing to get photos and text from everyone, but he did a great job pulling it all together. Due to the wonders of alphabetical order, I got the first shot in the book!